When I tried withdrawing money from my PayPal account, found automatic withdrawal option. The only question I had was about the withdrawal fees. I enabled Automatic withdrawal option in my account. Now when I tried withdrawing I still see the fees against my expectation of None. As usual PayPal will take few months to get that implemented. So I did not complete the withdrawal to see how PayPal handles fees when automatically transferring funds to my bank account. I want to how disable autowithdrawal transfer to my bank?? Katam, its not possible to disable auto withdrawal in PayPal. Hi, For automated bank transfer what is the minimum fee. What if I earn only 1$ in 7 days. Will that 1$ automatically be transferred to my bank account? If yes then how much fee Paypal charge? Any on experienced such situations?? Sachin, yes $1 will be transferred to your bank account and there is no fees for withdrawal from PayPal. I have $1 affiliate commission of many products and those gets credited into my bank account as well. GOI has pretty much screwed up a normal Indian earning genuinely.. if you have to issue a refund issue it from your CC. First pay fee to receive the payment and then withdrawal(conversion charges) and for refund payment again conversion charges and by any means if you accepted the payment for lesser dollar value and have to refund for a higher dollar value boy you are screwed up again. BTW I’m a web developer and I face these consequences everyday earlier it was good since our babus find themselves deep into the swiss money laundering they prefer to screw the common man in the name of counter actions. Could not agree more Nitin. GOI has ruined many Indian freelancers and could not understand the explanation behind it. Refunds in PayPal are now a big issue for small freelancer because small freelancer’s don’t have funds coming in PayPal daily but for large PayPal users you can still refund using PayPal balance if you have new payments coming to your PayPal account all the time. Let me explain this clearly before other take it in the wrong direction of big PayPal users are allowed to use PayPal balance. Let’s say A sends you money on 20th April 2012 but then he asks for refund on April 23rd 2012 and by this time you don’t have any PayPal balance and so only option is to refund A with a Credit Card amount. This does mean you are paying 3.5 to 4% extra for forex transactions. If on April 23rd you got some payment for some other person B. Before B’s balance is auto withdrawn, you can refund using B’s balance to A. It worked for me few month’s back but not sure about it now because there has been no refund for me in last few months in PayPal. Yeah very well explained Shabbir but even the freelancer with big projects not to mention the forex exchange fee will be higher as well so loss of a client + loss by paying higher intake fee + loss by higher outgoing fee LOL this is all as funny as it hurts. Donno how true it is but found something more interesting that seems like Indian GOI is not the only one making it all hard “Greedy” Paypal is also making fortune out of this and enjoying RBI Guidelines. I came to know that paypal do have an option to operate a bank account here and transfer funds from their own account(I believe Google Adsense doing the same thing) and make it all easy for us to withdrawal as per our convenience. I also read Paypal is doing the same in many countries. If anyone has experience with Google Adsense then what they used to do is send you checks in foreign currency(our preferred) which used to take around 20-25 days to get cleared but now since more than few years they issue local currency check in rupees from their indian account but you still get paid in Dollars in your Google Adsense account. So the balance in Google Adsense account is always in preferred foreign currency. So, it’s not just Indian Govt. alone but Paypal as well. Though it’s the most popular and Im sorta forced to stick with it so unfortunately this is the way it is. Nitin, let me clarify couple of things because I think something is not understood correctly by you. PayPal has a bank account in India and I assume it is in citibank because they NEFT the money through CitiBank but having a PayPal Indian bank account does not mean more profit for PayPal. At least I cannot think off anything that makes PayPal more money for having a bank account India. What may be happening is PayPal may be doing Wire transfers for all the money that needs to be deposited into various user account in India on daily basis and they may be getting premium forex rates for big transactions which they don’t pass to customers. PayPal forex rates has always been on the lower side (4-5% lower) even before RBI added those restrictions. 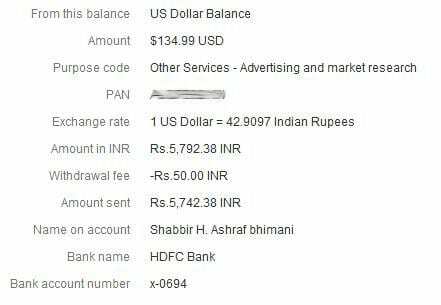 I am an AdSense publisher since 2004 and I have never seen Google sending USD checks to India or Indians but what they used to do is send check to Indian publisher in Indian currency from Singapore but now they send check from Google India office. I used to get INR check in 2005 as well. Thanks for the clarification but first on Google Adsense I had an account earlier than that I guess since 2002 I don’t exactly remember but surely they have always sent me checks in Dollars which I used to deposit in my ICICI bank a/c so I’m pretty much sure about it 🙂 I guess you may have INR as your primary currency since beginning and I had USD but now with the same account last check I received was in INR and it was local check. Regarding Paypal you get me a little wrong my whole point was as per RBI guidelines Paypal cannot hold foreign currency earned by us for more than 7 days(donno if it has changed to 1 day now) it has to be in India at all cost and thats why earlier Paypal has asked every Indian a/c holder to withdraw every 7 days but looks like no one was following nether did I :p so now they imposed an every day auto withdrawal which in result we cannot maintain a Paypal Balance which again results into paying forex conversion charges when we have to refund. Now, if Paypal is kind enough to withdraw all the balances to it’s own account in India instead forcing withdrawal into our account we can easily maintain a paypal balance. Now the thing is this way Paypal has to bear one way forex exchange charges which they are ripping from us.. so thats why I said it’s both Paypal and Indian GOI making it hard for all of us. Oh! I guess it’s 3.5% paypal charge as currency exchange fee. Okay tell me one thing I still have a Google Adsense Account and the last check I remember was in Indian currency but my current balance with them is still in USD. Google is maintaining it in a fair and genuine way now imagine if we could use my Google Adsense balance for any other purpose (may be Adwords) then in which currency we will be paying? obviously the same in which they are maintaining our balances with them and not to forget they pay us in local currency. Nitin, Google Adsense program started in June 18, 2003 ( http://www.google.com/press/pressrel/adsense.html ) and in 2004 I got my payment in INR and so not sure if USD as payment to Indian publisher was offered in first few months of inception or not but as you said you got USD check in India, I assume it to be correct. What you have mentioned about PayPal is right but then why would PayPal do that. In fact no company on this planet would take the undue risk of forex fluctuations unless their main business is trading in forex. Even the largest public listed company of India Infosys also hedge the USD INR fluctuations so they can predict the company performance better in advance. Regarding your Adsense earnings you cannot spend anywhere. Not even in Adwords and you can get paid as INR check and you can create an Adwords account with pre payment option and transfer the same money earned from Adsense into Adwords account. Google is a company and not a bank right? and still they pay from their a/c after converting from USD to INR the same PP can do as well but I know there is no point doing it for them :p I understand your point. Also, told you I wasn’t sure when I had my Adsense a/c i thought it might be 2002 as thats the year when I started my business so guessed could be that. Oh! I know we cannot spend our adsense earnings I was just stating an example. Nitin, Google is a company and they can pay using their own account but then they don’t allow you to send or receive funds and so they can operate based on earnings and expense. Earnings is from Google USA parent company and expense is paying to publisher. Now with PayPal you can move funds between account but for India, they need to have some regulatory bindings if they allow transfer of funds and so instead of being binded by those regulatory they offered not to allow such transactions. So I don’t think there is much PayPal can do but yes if it would impacted their business badly they may take steps to being becoming a bank in India but I don’t think it has impacted PayPal to that extent. how the hell one should issue a refund …i got a payment, cannot deliver the goods and money is already been auto withdrawn, I seriously will have close down my paypal account, just impossible to work with these guys…. Refund from your Credit Card. From time to time I need few dollars on Paypal for some smaller purchases. But, due to this Auto Withdrawal that is not possible. we (indians) cannot use our existing paypal balance to make any kind of purchase. You anyway cannot pay using PayPal balance and so it does not matter if you have the money in PayPal or not but you cannot pay using it. Is there any way of stopping the “Auto Withdrawal” option in my a/c ? No, it is not possible to stop auto withdrawal and why do you want to stop it? How about Payza.com? My Alertpay account ( I never used it though) turned into Payza.com. I found their terms are liberal but yet to start using it. Do you have any experience with these people Shabir? I found “Donate” button (from Paypal) on your homepage. I recently heard from Paypal that they withdrawn “Donate” facility in India and no Indian site or Indians can accept donation via Paypal. How come you manage to keep it still? Are they allowing it now? Where? I don’t have donate button anywhere on any of my site. Look at your home page Shabir. Let me know if you still have any confusion. hey Vicky! Everything was going on fine with my account! 2 days back my money was transferred automatically to my bank account! and since then, everyday my money is transferred to my bank account due to activation of auto withdrawal service!! i have 3 year old account with paypal, but i think govt of India have changed the policy with paypal! I added a new account and PayPal turned ON auto-withdraw featured WITHOUT MY PERMISSION. Now I DO NOT know HOW TO TURN IT OFF? Does anybody know how to turn it OFF? Vicky, you probably cannot turn auto withdrawal off. Ask support to see if they help. Thanks Shabbir. But my another account (that is 2 years old) does not have this issue and I can still hold money in it? Not sure if this mandatory auto-withdraw is only applied to new accounts. Do you have any idea reg. this? Vicky, if you add new bank accounts it automatically selects one of them as default and so you cannot opt out. For old accounts still you need to be selecting one bank as default for auto-withdrawal which once done cannot be un-selected but only changed. Also as of now there is no point in holding the money in PayPal because you anyway cannot use that money for anything but withdrawing. The feature can be accessed by clicking the â€œWithdrawâ€ tab at the top of the PayPal page and the link is underneath the manual withdrawal methods. There are a couple of things to consider before enabling this though. Firstly make sure you click to enable the Electronic funds transfer (2-3 days) and not the faster method (1-2 days). If you inadvertently select the faster withdrawals then youâ€™ll pay Â£5 per day for the privilege. You should also be aware that there is a minimum withdrawal of Â£6.00 at any one time from your PayPal account. i have posted my conv with paypal support @my blog. But we need to wait.. as always to see how they have implemented it. PayPal charges that fee (INR 50.00) for withdrawals below INR 7,000. I guess they are charging you as your amount is below that INR 7,000 mark. Have you tried auto withdrawal for amount more than that? I think PayPal should have made a disclaimer that standard charges will also apply on auto withdrawal. Abhik, they have made the disclaimer that when you enable auto-withdrawal there will be no fees for any type of withdrawal. At least my understanding of the FAQ was (and is) that only. Paypal never charged me for withdrawals of $10 and its multiples seperately. They would credit the full $10 or $20 to my account and then transferred to my bank in INR. The only amount they take is the gain they make on exchange price. They often calculate exchange rate below the open market- around Rs.2- 3 less than the current exchange rate. This way Paypal makes 2 to 3 rupees on every USD they convert to INR to the linked banks in India.